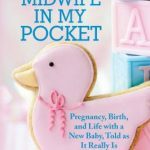 One of the unique things about being a student midwife, is the ability to view practice from an outside perspective. We can question ‘why?’ and ‘how come?’ with explorative expression and the innocence of the inquisitive mind. 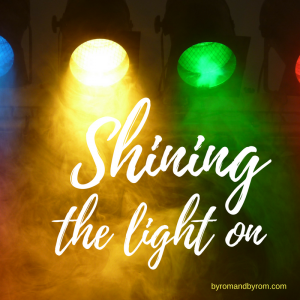 It is this which gives my position of being the student a sense of power, as my questioning of why things are done a certain way is not seen as being confrontational or undermining or to anyone. 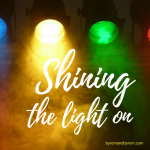 During my first year as a student midwife, the questioning of things I saw or witnessed usually stayed within my mind, as having the courage to speak up was not something I felt comfortable with. However, going through second year, I found the courage to question and the passion to want to find better ways to improve maternity services for women, babies and families. Earlier this year, while undertaking a placement on delivery suite I was caring for a woman in labour. Everything was fine except she spiked a temperature over 38 degrees which initiated the septic pathway for her and her baby. Nothing unusual, as I have cared for lots of women and babies where this was needed, both on delivery suite and on the postnatal ward. As usual, the doctor was called to come and cannulate the woman for IV antibiotics, and the neonatal doctors alerted to prepare for cannulation of the baby. Having done this so many times without question, it was the woman’s angst at having her newborn removed from her for this which sparked my inquisitive mind. It is usually normal practice within many maternity services to take babies to the neonatal unit (NNU) for the cannulation procedure, and administration of the first dose of antibiotics, which can take anything up to 2 hours. It was at this moment that I questioned why the cannulation of the baby couldn’t be done in the room with mum. 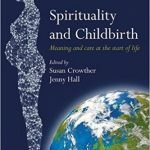 Suddenly, the practice of separating women and babies so soon after birth hit me, and remembering all the times I had taken babies from women on the postnatal ward to NNU for the same reason made me feel very uncomfortable. I began to question the whole reasoning behind why we were separating babies in this way, and not only that, I decided to do a little research into the damage caused, if any, as a result of this practice. 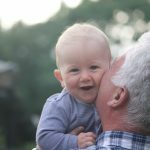 I soon discovered the true nature of the potential harm this seemingly innocent practice could have on both mum and baby, not to mention the damaging effect it could have on the chances of establishing breastfeeding. After doing a little background reading and research, I made it my mission to raise awareness of the harm caused by this separation and to help promote togetherness of all mums and babies where ever possible. After some thought, I could not see any reason why equipment could be set up on both the delivery suite and postnatal ward to enable neonatal cannulation to take place with mum, or at the very least facilitate the choice for mum and family to stay together during this procedure, and while I was familiar with the work of Dr Nils Bergman and the benefits of kangaroo care for premature babies, it was his work on zero separation of mums and premature babies which inspired me to campaign for the zero separation of mums and babies in my hospital. I was motivated by the realisation of the potential damage caused both physically and psychologically from the practice of separation and short term NNU admission. #ZeroSeparation is the Twitter campaign I am using to champion changes in practice where avoidable NNU admissions take place which can be prevented with interventions and promote togetherness of mums and babies in the postnatal period. 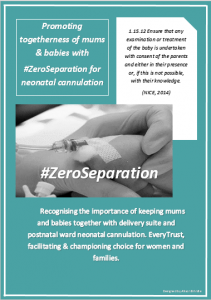 The campaign which first started with the championing #ZeroSeparation for neonatal cannulation is now being promoted at Lancashire Teaching Hospitals Trust (LTHT). I designed posters to highlight guidelines and recommendations to promote #ZeroSeparation and there is currently a display championing this on the delivery suite. I was recently excited and pleased to see the Chief Executive of the Trust, Karen Partington, with the display on a recent visit to the unit. This work has now inspired me to champion and campaign for #ZeroSeparation for other situations. I am now working on expanding my campaign to include other avoidable situations where mums and babies are separated such as for treatment and prevention of transient hypoglycaemia of the newborn, especially in women with diabetes or other conditions where there is a higher risk neonatal hypoglycaemia. 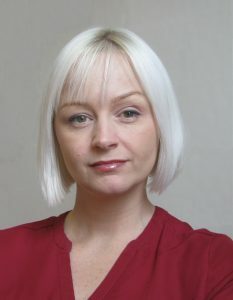 Ali Brindle is a student midwife at the University of Central Lancashire.